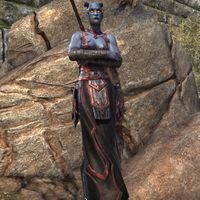 Xivilai are powerful Daedric humanoids who often serve Molag Bal. They wield Daedric battleaxes in battle. They generally have horns on their head, blue skin, yellow eyes, and sometimes come in pairs. The enemy summons frost around its weapon, causing most attacks to deal additional frost damage. A charged melee swing that does moderate physical damage. This attack can be blocked to set the enemy off balance. If the enemy's weapon is empowered, this attack will root the player for a few seconds as well. The enemy raises its arm to call down lightning to strike the area around it, as indicated by red circles. This attack does moderate shock damage. The enemy sends three fire lines towards its target dealing moderate flame damage to all opponents hit by it as indicated by red circles. This spell can be interrupted to set the enemy off balance or simply avoided. The enemy may summon a Daedric servant, such as a Flame Atronach, Clannfear or Ogrim, to assist them in battle. Killing the Xivilai will banish the summoned daedra. This page was last modified on 30 October 2018, at 01:41.